Continuing on my seemingly inexhaustible roll of cocktail bar articles, came this commission from Surface magazine for an interior design feature on Shanghai cult favorite bar, Logan's Punch, opened by the affable Californian Logan Brouse. The interiors were created by renowned firm Neri & Hu, celebrated for their work on restaurants including Jean-Georges Vongerichten's Mercato and Jason Atherton's The Commune Social. Download pdf here. My latest feature in Food & Wine. My editor contacted me when she heard that Shingo Gokan, partner in NYC's legendary Angel's Share, was opening his own venue in Shanghai: Speak Low. Angel's Share is the speakeasy-style bar lauded for revitalizing the form back in 1994. I then spent many a long night "researching" (quotes are my husband's...) Shanghai's best new bars. Besides Speak Low, I also featured Starling, Senator Saloon, E.P.I.C., Tiki China, El Ocho and Union Trading Co. Download full pdf here. When creating Food & Wine's annual Go List on Shanghai, I had the hard task of choosing just five outstanding new (opened within the past two years) restaurants among many deserving contenders. I chose the mind-bending Ultraviolet, immaculate steaks and sides at Fifty 8 Grill, zen artistry and haute vegetarian cuisine at Fu He Hui, Old Shanghai glamour at Light&Salt and more superb vegetarian eating at WUJIE. Download full-size jpeg here. When my editor at Travel + Leisure article read my Shanghai cocktail story in Food & Wine, he requested one too! It was back to the long, hard drinking nights for me as I investigated the city's latest alcoholic trends. The Travel + Leisure article featured two of the same bars and two new ones, including the sultry, vintage jazz destination, Heyday. Download full-size jpeg here. Once again putting together Conde Nast Traveler's Best New Restaurants in the World list for Shanghai, I featured Ultraviolet's surreal one-table experience, Colegreco and Mercato, both housed in Three on the Bund, Elefante, the playful Spanish restaurant from Willy Moreno, Italian favorite Scarpetta and several others that were featured on CNT's website as they didn't fit in the magazine: 8½ Otto e Mezzo Bombana from three-Michelin-starred Umberto Bombana, Xin Dau Ji, the Cantonese winner of one Michelin star at their Hong Kong branch, and the sadly now-closed Hunan spot Xi Na. Download the pdf here. One of my favorite cover stories in Time Out Shanghai: counting down the 50 best dishes in the city by price, starting from just 3RMB. 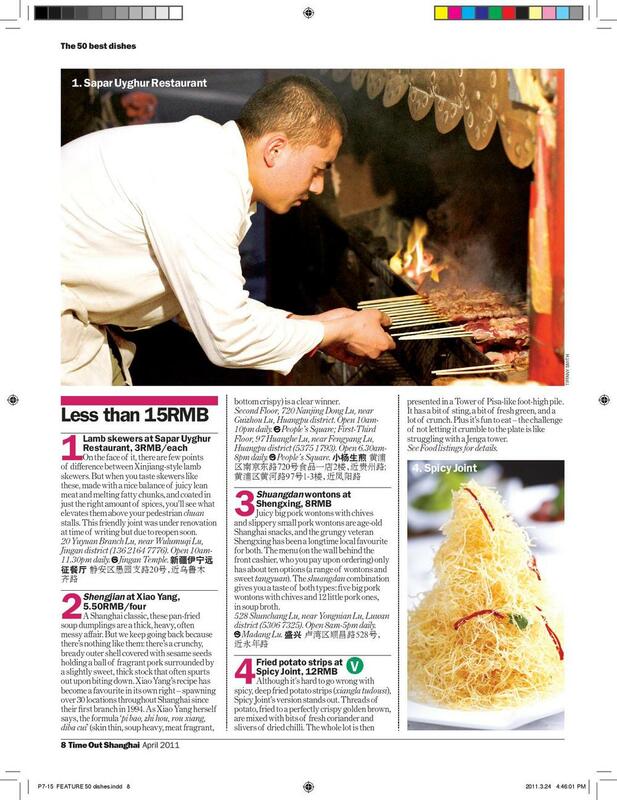 Published in March 2011, some of these dishes (and restaurants!) don't exist anymore but the ones that do are as delicious as ever! I created a monster spreadsheet and our entire team fanned out across the city to taste and test every dish. Download the full-size jpegs here. China is known the globe over for its extraordinary culinary culture yet few people outside the country know more than a dozen dishes from a few provinces--think General Gao's Chicken, beef and broccoli and dim sum. For this story, I sought out the best of the legendary Eight Great Cuisines from eight provinces, as served in Shanghai. I scoured the city for volcanically-spicy Sichuan noodles and sparkling Shandong seafood. These menus illustrate the jaw-dropping variety of China. My favorite finds were the Anhui cuisine of Hui Zhen Yuan and the Shandong menu at Donglai Haishang. Download the full-size jpegs here. Mid-Autumn Festival means one thing in great excess: mooncakes. Few admit to loving them, most claim to loathe them but this doesn't stop the annual gifting (and re-gifting) of millions of these round-like-the-moon pastries which are traditionally filled with sweets like lotus root paste or chopped nuts. For this feature I made a handmade batch with a chef trained in the imperial style of mooncakes which originated in the Qing Dynasty. Download the pdf here. There's always room for dessert, especially in a city that loves its sweets. Shanghai cuisine is known for its sugary character--even the city's renowned pork belly dish, red-braised pork (hongshao rou), is made with a generous portion of rock sugar. For this feature we tasted cakes, pastries, ice creams, shakes, pies, fruit puddings and much much more, all in the name of bringing you Shanghai's Best Desserts. Download the pdf here.